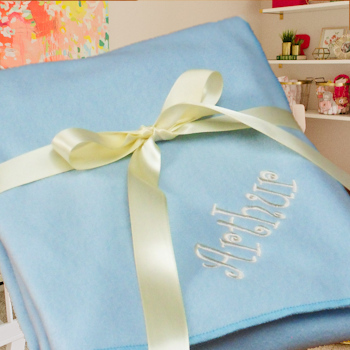 Any name embroidered on this bespoke baby blanket in a thread colour and letter font style of your choice. Made from good quality 100% polyester polar non-pil fleece fabric. Made from good quality 100% polyester polar non-pil fleece fabric. We make these blankets to order. A handy pram size of 75x100cm. The edges are overlocked stitched. Please enter the name, nickname or initials you would like embroidered and select from the options provided. Name is sewn towards one corner of the blanket. Your beautiful baby blanket gift will be custom made in the UK.